When you hear the name Black Magic you might think of something wicked like a witch or Halloween but its not wicked like that but it is wicked good. 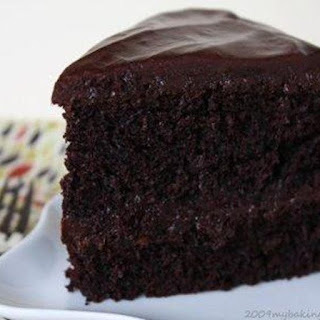 I saw a recipe for a cake called Black Magic Cake and it called for Black Cocoa Powder, I didn't know that it exists until I looked on Amazon and it was real. The Black Cocoa Powder gets it color from Dutching, they add an alkalizing agent to natural cocoa powder helping with the color. It also gives the cocoa powder a neutral pH, lower acidity, smoother in flavor and increase solubility. When I made the sauce I thought it would be bitter no matter how much sugar I added to it because dark chocolate or a semi-sweet chocolate but I was really surprised. 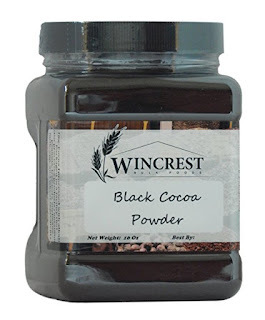 The cocoa powder itself is a really dark brown but once you mix with a liquid it turns black. This sauce taste like a gooey fudgy brownie in a liquid form. Use this on ice cream, pancakes, waffle or mix it in some milk even your coffee. In a large sauce pan, combine sugar, black cocoa powder, salt and water. Let boil for 10 minutes. Add in vanilla extract and coffee, turn down the heat and let it simmer for another 10 minutes. Whisk frequently. After it has simmered turn off the heat and let it cool completely before transferring to your bottle of choose. Store in the refrigerator. This looks so yum and even extra yum because it's vegan!! Woohoo! :) Must try it out one day. Thank you so much and it is really yummy. I'm slowly working towards doing videos on here. This sounds delicious. I am just wondering can I replace sugar with stevia? Of course, just use a 1/2 cup less of the Stevia. I didn't realize there was such a powder as well. The sauce appears to a great sauce to use for cooking. I am moving more toward natural cooking as well. It was new for me as well and I always looks for a natural way to cook or bake.